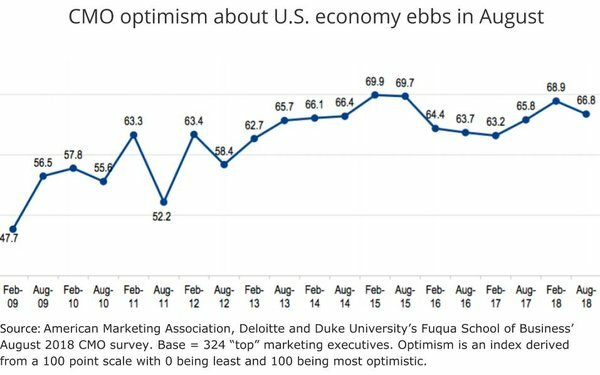 The confidence of top marketers in the U.S. economy has fallen from a near recent high, according to results of the semi-annual CMO Survey conducted by the American Marketing Association, Deloitte and Duke University's Fuqua School of Business. The findings, which are based on a survey of 324 "top" marketing executives polled in August, fell to an index of 66.8 from an index of 68.9 in February. The index is derived from a 100-point scale with a 0 being "least optimistic" and a 100 being "most optimistic." February's near-high compares with a high of 69.9 set in February 2015. The findings are important, because some observers consider that the economic confidence of marketers may be a leading indicator of their willingness to invest in media, marketing and technology. 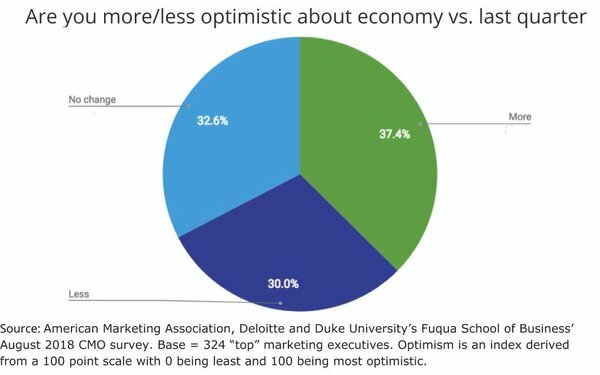 On a more near-term basis, the CMO Survey found that slightly more than a third (37.4%) of respondents are more optimistic now than they were in the previous quarter of this year, while 32.6% have not changed, and 30% said they are less optimistic about the economy.